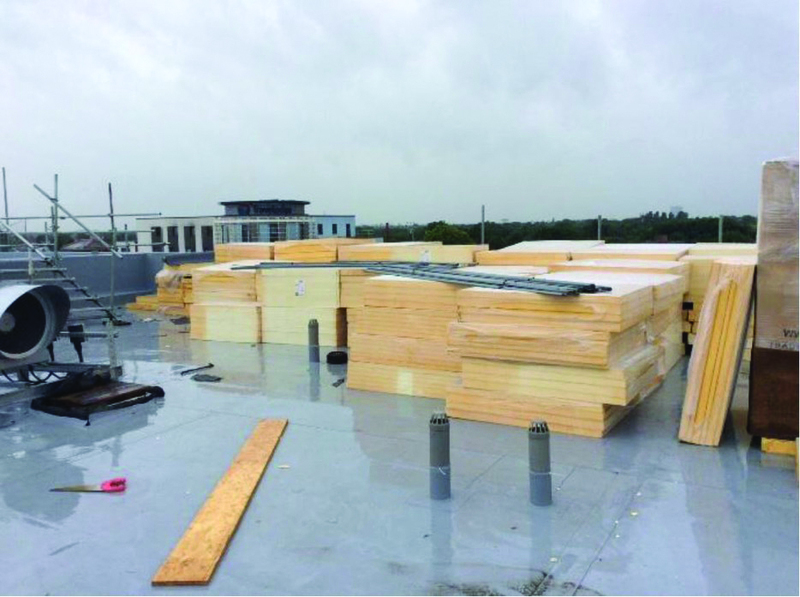 This month the Inspector offers up some tips to ensure you have a successful roofing year ahead. A number of common issues and industry myths have been addressed throughout last year that hopefully offered some useful information and guidance. As we enter 2019 and the winter period (and the inevitable construction slowdown that follows), we thought it would be prudent to reinforce some of that advice to help you all work safely and ensure that projects, still in their infancy, are prepared for the months ahead. Wear the correct PPE at all times. Working surfaces are naturally more slippery during this period so ensure appropriate footwear is worn and extra care is taken when working on roofs. Do not put yourself at risk unnecessarily, and ensure the appropriate risk assessments are completed before carrying out the work. The British weather has the ability to destroy a project in a matter of minutes. Whilst the industry as a whole is frequently challenged by the weather, ignoring those forecasts for the sake of early completion could lead to more expensive consequences in the long term. The success to any project is storing those products properly. Keep them covered, keep them off the ground and keep them somewhere dry. Defective materials quite simply will lead to a defective project. Larger projects may require phased installations, so ensure night joints are sealed properly and temporary protection is considered to any areas of incomplete work. 5. Keep all working surfaces clean and free of debris. 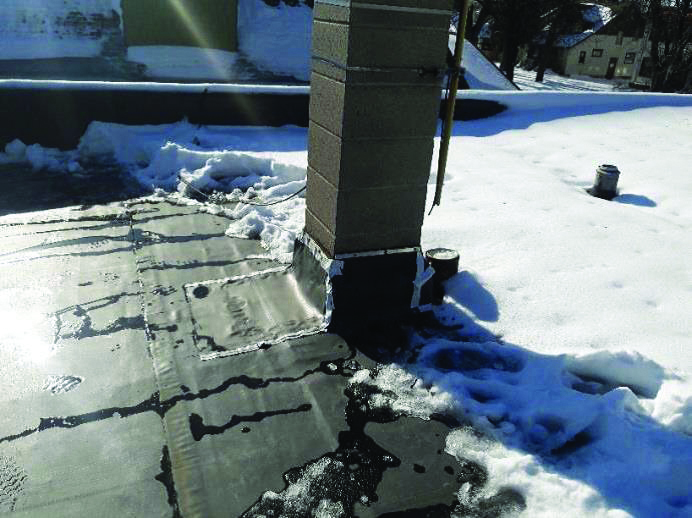 Snow and frost can hide sharps and fines which could puncture the waterproofing system under-foot. Winter light also reduces visibility so ensure the roof is swept clean at the end of each day, well in advance of the drawing nights. If surfaces are frozen in the morning, take extreme care when thawing the roof out with gas torches, refraining from any hot work if combustible materials are present. Furthermore, check with material manufacturers when using salts to ensure chemical compatibility is not a concern. Coarse salts can also damage the waterproofing so protection boards should be considered as a means of temporarily protecting against both the weather and foot traffic. Maintenance and housekeeping is key throughout the winter period as leaves and moss will have congregated around those outlets and gutters from the autumn fall. It is therefore essential rainwater goods are cleaned of any foreign build-up to ensure free passage of water, thereby reducing any snow and ice retention on the roof. 8. Examine all mastic sealant and mortar pointing for signs of degradation. Mortar and sealants will be subject to a freeze / thaw cycle throughout the winter which will accelerate their natural ageing process. Ensure all pointing is maintained and replaced as necessary to prevent water penetration. Cover flashings are essential in protecting upstands from water ingress. Any loose items should be fixed and any missing areas replaced to ensure the roof perimeters remain secure and watertight. Heavy snowfall may raise the water level above the flashing heights and it is therefore critical they offer the protection intended. Liquid applied systems require a minimum application temperature of 5° to cure properly. If liquids are applied in lesser temperatures they may not cure and will likely be compromised by moisture, which could lead to failure. 11. Report any defects as soon as possible. If any defects are found, ensure the material manufacturer is notified at the earliest opportunity. Addressing defects at the earliest possible stage will stop the problem getting worse and help maintain the expected lifespan of the system.